There can be few more enduring images of the modern U.S. military than that of the almost 'indestructible' Humvee. This image is equally true of current operations in Iraq, where Humvees endlessly patrol city streets and country roads. 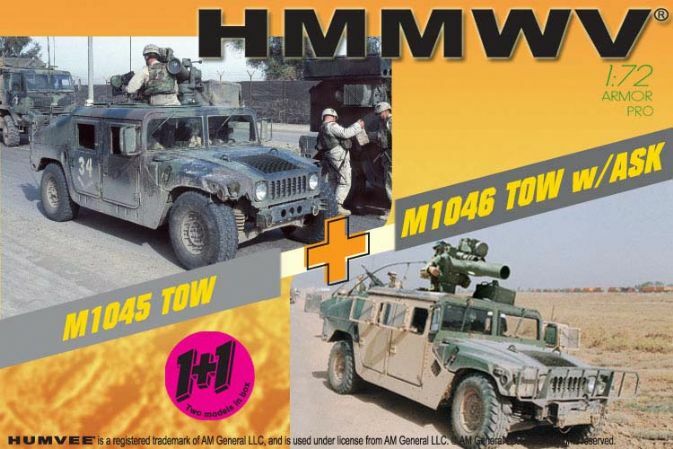 When fitted with a TOW missile launcher, the highly robust and successful HMMWV is known as the M1045, and when a winch is mounted on the same vehicle, then its designation changes to M1046. Dragon now brings new 1:72 scale model kits of these two variants of the HMMWV, both in a single box. Furthermore the M1046 TOW version also has an ASK for the roof-mounted gunner, ideal for modeling a vehicle countering the ongoing insurgency in Iraq. The TOW was first produced in 1970 and is the most widely used anti-tank missile in the world. The M-220 TOW is the premier airborne, air assault, and light infantry's answer to armor. The TOW (tube launched, optically tracked, wire guided) missile system is capable of defeating armor at 3.75 km. New improvements include a built in laser range-finder, night time thermal optics able to view out to over 8000 meters at night, and fewer parts required to run the system.